One of the most common–and certainly most annoying–things we runners hear constantly is how all that pavement pounding we do while running is ruining our joints, specifically our knees. Fortunately, science continues to prove otherwise. A recent study published in the Journal of Applied Physiology found that even short bouts of running actually decrease markers of inflammation that are known to compromise the integrity of the joints. This admittedly small sample used 6 recreational runners and asked them to both run for 30-minutes and to do 30-minutes of equal intensity but unloaded activity (think pool running, the elliptical, cycling… anything that is low impact on the joints). Participants either ran first and then did the unloaded activity or vice versa. Researchers took samples of blood and joint fluid both before and after each session and measured the samples for a number of inflammatory markers and proteins. Results showed that levels of inflammatory markers–the kind of things that cause joint damage such as arthritis–did not change after the unloaded activity but decreased significantly after running. The decrease in these markers was also (negatively) correlated with the number of footstrikes suggesting that the longer one runs and the more footstrikes one makes, the more inflammation is decreased. 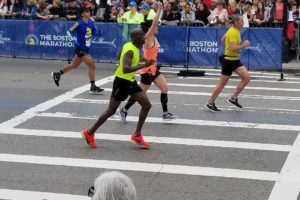 Furthermore, running but not unloaded activity also facilitated the movement of inflammatory markers out of the joint fluid and into the blood (which is a good thing). In summary, brief bouts of running was found to successfully decrease acute inflammation of the knee joint which is likely to provide long-term protection and maintenance of the joints. But what about kneemonia? And kneesles?